Upgrades from US$139. Session runs for 30 minutes only. Save and Total Recall functions disabled. Check the website for the latest available prices. Reaktor is a complete modular sound-design studio. REAKTOR opens a universe of sound. It's a deep and powerful modular studio that sets no restrictions on creativity. More than 70 unique synthesizers, sound generators, grooveboxes, sequencers and effects are at your fingertips, with 3000+ more freely available in the Online User Library. Customize existing instruments, or create your own individual sound generator from scratch thanks to the fully modular architecture. REAKTOR 5.5 is a true playground for the creative mind. 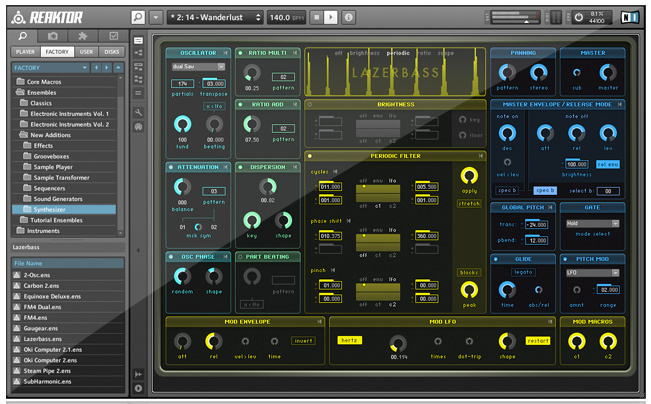 REAKTOR is equipped with a vast library of more than 20 impressive and innovative instruments. Powerful samplers allow far reaching granular resynthesis and the innovative effects pave the way for profound sound manipulation. The stunning array of synthesizers delivers everything from rumbling basses to searing leads and beyond. The wide range of sequenced instruments and drum machines lets you create dynamic rhythms, melodies, chord sequences and more. From authentic emulations of classic gear to bizarre, otherworldly creations; from the conventional to the controversial REAKTOR delivers. Internationally known artists and designers have contributed to the extensive library of presets and instruments. Its unique sonic flexibility establishes REAKTOR as the ultimate tool for musicians and producers working in studios both large and small. A particularly fast and immediate control of the sound guarantees musicians on stage a lively and inspiring performance. The unrivalled sound is made possible by the REAKTOR Core Technology™ and new, highly advanced algorithms. REAKTOR is also an extraordinary sonic laboratory, its modular design releasing you from the constraints of more conventional setups. The extensive library of macros and modules combined with REAKTOR's clear, uncomplicated interface turns the construction of sonic tools into an intuitive process. The instruments are now completely "skinable". All of the graphical elements can be fully customized, allowing totally individualized instrument design. The online REAKTOR User Library offers an extensive platform on which an ever-growing global community exchanges a vast number of instruments and ideas. The fifth generation of this award-winning modular studio offers completely new dimensions in designing and producing custom instruments. REAKTOR Core Technology™ delves deeper into modular construction than ever before. Develop your own individual modules; build unique filters, oscillators and fully personalize your library. REAKTOR Core Technology™ benefits everyone. It is a visual audio development environment with integrated run-time compiler technology, allowing the creation of individual, high-performance low-level content. To record audio you will need an Audio Interface: See our list of the best USB Audio Interfaces here. New Blocks framework which provides the speed and flexibility of modular synth patching combined with the benefits of working in the digital domain. Bundled with 30 Blocks in several categories, each with a specific purpose. Bento Box Blocks represent the core components of a modular synth setup. Boutique Blocks take inspiration from custom hardware that bring advanced sound shaping to the world of modular synthesis. New enhancements for the advanced builders creating their own synthesizers, effects, and audio devices. Three key additions extend REAKTOR’s workflow efficiency and sampling power at the Core level. 64 Bit support for Windows and OSX. Added breadcrumb navigation to structure. Added searchbox (Win: Enter or CTRL-F, OSX: Enter or CMD-F) to add modules. New module reference and 5.6 manual addendum. Recorder shows recorded time while recording. Added shortcut info to tooltips.